RIVERSIDE, Calif. – In August 2010, an entomologist at the University of California, Riverside discovered a tiny fairyfly wasp in upstate New York that had never been seen in the United States until then. Nearly exactly a year later, he discovered the wasp in Irvine, Calif., strongly suggesting that the wasp is well established in the country. Called Gonatocerus ater, the wasp is about 1 millimeter long and arrived in North America from Europe. It lays its eggs inside the eggs of leafhoppers. Leafhopper females lay their eggs inside plant tissue. Gonatocerus ater females find these eggs and lay their own eggs inside them. When the wasp eggs hatch, the larvae eat the leafhopper eggs. Triapitsyn explained that the wasp had been reported in Italy where the leafhopper Rhytidodus decimaquartus was determined to be its host. 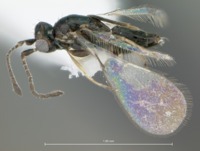 “In California, we do not know if the wasp’s host is this leafhopper, but I found it on the same Lombardy poplar trees that had the wasp, so an association is very likely,” he said. Triapitsyn found the wasp on August 7, 2011, when he was doing field work along a trail. He caught the insects in a net that he had swept over Lombardy poplar leaves. He preserved the sample of insects in ethanol and brought it to his lab at UC Riverside for analysis and identification, which can take long. He got a positive identification of the potential leafhopper host only two weeks ago. According to Triapitsyn, the wasp poses no known risk – besides killing leafhopper eggs. In August 2010, Triapitsyn discovered another species of Gonatocerus on a large willow tree in the middle of a lawn on the campus of the New York State Agricultural Experiment Station in Geneva, NY. 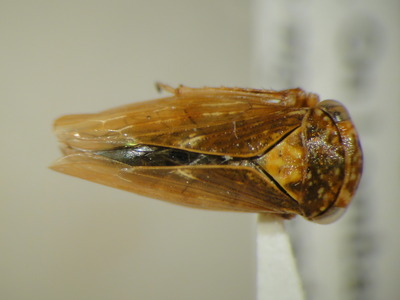 Image shows the leafhopper Rhytidodus decimaquartus. Photo credit: Doug Yanega, UC Riverside Department of Entomology.